Please consult manual for usage instructions. Not to be confused with the tax evasion concept of Strawman theory. “”This was to show exactly what evolutionists believe, but can't back up through the fossil record. Unintentional misrepresentations are also possible, but in this case, the misrepresenter would only be guilty of simple ignorance. While their argument would still be fallacious, they can be at least excused of malice. A straw man debate takes the following form. Person X raises argument A1. Person Y describes argument A1 as argument A2, which appears similar to (but is substantially different from) argument A1. Person Y refutes argument A2. Person Y claims that argument A1 has been refuted. P1: X (their argument) is Y (the strawmanned argument). P2: Y (the strawmanned argument) is false. C1: X (their argument) is false. The syllogism is valid unless X is not Y; in a strawman argument, X and Y are different. Many X are not Y. Most X are not Y. It is common to represent an opponent's position as being an extreme position -- eg, that pro-choicers think all abortions are acceptable, or that pro-lifers think no abortions are acceptable. This is because it is easiest to defeat the forms near the extremes and hardest to defeat the forms near the middle. For example, to defeat "All X are Y" proof of only one counter-example is needed (namely, one statement of the form Some X are not Y). Conversely, to defeat Some X are Y, proof of a complete lack of examples is needed (namely, that "No X are Y"). Proving categorical statements is harder than taking them down. Steelmanning is a neologism for the principle of charity, coined on LessWrong by Scott Alexander, in analogy to "straw man". The principle of charity is the maxim that in debate, one should take the strongest possible understanding of the opponent's position. It is a warning against the straw man argument. Only if you defeat the strongest possible version of your opponent's argument can you say that you've robustly defeated their position. Related to steelmanning is the Ideological Turing Test, which asserts: If someone understands their opponent's belief so well that they can convince a blinded observer that are a true believer, and yet still don't actually believe it, there's a good chance that that belief is wrong. The first part of this test is useful: if you can repeat somebody's argument back to them in such a way that they agree with everything you say (and do not wish you had included more), then you have properly understood/summarized their position. However, the second part is not: just because you can understand somebody else's view fully, but still reject it, does not mean that their belief is incorrect. This is because your rejection of their belief is based on additional beliefs that you hold, which may be incorrect or which they may not accept. See also Dennett's Rules, which includes a version of steelmanning. Unlike steelmanning, Ironmanning is the converse of strawmanning. An ironman argument is an intentional misrepresentation of one's own or another's position, often used to make it appear that one's arguments are stronger than they actually are in order to more easily defend it, or to make it appear that one's critics are unfair or shrill. The title of the argument comes from the art of practising fighting techniques against men made of straw: which is a problem in that straw men don't fight back, don't wear armor, don't bleed and generally aren't anything like the sort of thing you would actually encounter in a battle. Therefore someone arguing against a straw man is just arguing against an idealised opponent that only exists in that person's own head. Straw men are notoriously easy to construct, and require little more than extending the opponent's arguments beyond their original point until their stance appears ridiculous - appearing like the fallacious use of reductio ad absurdum. Once the opponent has accepted (or failed to refute) such a set-up, one can simply attack the straw man position instead of the opponent's actual points, and claim any subsequent attempt to correct the situation as conceding the argument. Sometimes it's so easy, you can do it without thinking. Straw versions of evolution are remarkably common. After all, it's definitely in the best interests of creationists not to actually teach it properly. Straw man arguments against religion are also easy to generate - conflating religions together into one entity is perhaps the most common. Zen and Christianity have almost nothing in common, for example, yet both can be dismissed readily by a straw man of a generic "religion" concept. Defining anyone who is even moderately religious as an unthinking, sheep-like entity who blindly accepts whatever their priest or pastor tells them is another. In this case, the straw man is to conflate fundamentalism with mainstream belief - decent sites such as Fundies Say The Darndest Things on occasion have an unfortunate tendency to mistake anyone talking about prayer, faith, or Jesus as rabid fundamentalists. Straw man positions on religion are often held by anti-theists: who generally are, let's face it, teenagers who have just discovered the internet. Prominent biologist Richard Dawkins has been accused of generating straw man religions to fight in his pro-atheism writings such as The God Delusion by falling into a few of the traps discussed above. For a good example of lumping religion into one, type "science vs religion" into Google Images. What you will find is a large collection of memes that compare science with fundamentalist, young-earth, creationist Christianity. None of them take into account that most Christians don't accept the Old Testament or Genesis creation myth as literal fact, nor the fact that religion is not an alternative to science, since it is possible for a scientist to believe in God. The only other religion mentioned is Islam, along with the fallacy that "religion flies you into buildings". A straw man in action. Surprise, the strawmanned side "lost"! "Atheists reject Christianity specifically: why aren't you getting mad at Muslims?" There are enough strawman versions of atheism going around to fill a whole article itself. This is most likely due to the fact that religious apologists who generate these arguments have never been atheists (or possibly exaggerate their 'atheism' if they have been), in contrast to many atheists who were previously believers. What usually unites straw arguments against atheism is that they're constructed when a specific religion thinks that it's all about them — thus ignoring the main point of atheism, that it's the rejection of all religious belief equally. Further common ones include the assertion that atheists "believe in nothing", which seems to confuse it with the distinct concept of nihilism (even then, "believe in nothing" is a slight strawman of nihilism) or that they lack a moral code or any concept of morality. The latter either stems from or forms the base of the argument from morality, but is easily refuted simply by looking at the behavior of atheists, which is most conveniently done by examining the crime statistics of secular countries. In the political sphere, the easiest way to construct a straw man is through the generous application of stereotypes. By making the assumption that a politician believes in all the ideologies associated with their general political leaning, they can be dismissed more easily. For instance, assuming a fiscal conservative is also socially conservative or assuming a pro choice politician is also in favour of extreme wealth redistribution are common fallacious straw men that are made by politicians, pundits and voters themselves. For the left, a common strawman is assuming that pro-life advocates must be pro-life on all issues (such as opposing capital punishment), not just abortion, and calling them hypocrites if they are not (although some pro-life advocates do oppose both). This is no more true than the example of pro-choice advocates having to favor choice on all issues, not just abortion. The same is true of conflating ideologies, such as stating that liberalism, socialism and communism are identical political ideologies (a rhetoric notoriously popular in the US). This is extremely problematic in politics because it is not possible to give an accurate appraisal of political beliefs without knowing what those beliefs are, or by presuming that belief A automatically means subscribing to belief B. This is also used within politics to introduce snarl words into discussions. It is quite easy to make a straw man argument of woo explanations and things like alternative medicine. The classic example is homeopathy, an alternative medicine treatment where active ingredients are diluted substantially, on the principle that the more dilute it is, the more potent it is. In fact homeopathy often takes this to the point of diluting the substance until no trace of it remains in the remedy. It is, of course, absurd to think that this could work, but it is also a straw man argument because homeopathy includes a succussion procedure involving striking the solution in a special way. Thus, homeopathic remedies aren't "just dilutions" but dilutions that have been whisked about a bit. Woooooooo! It is contentious whether this is a true straw man position, as the burden of proof lies with homeopaths to establish that the succussion procedure adds anything new to the remedy, such as instilling water memory. Thus, given the balance of evidence, homeopathic remedies are just dilutions. Skepticism, however, requires an honest appraisal of all the facts and ignoring the striking involved in succussion, even if it is just an escape hatch, is still wrong in principle. Remember extraordinary claims require extraordinary evidence. Particularly on the internet, it is easy to create a straw man feminist argument by jumping to generally inaccurate conclusions and cherry picking (particularly involving extreme views held by a minority). Such arguments include things like "feminists want women to rule over men" or "feminists are reverse sexists". This almost inevitably involves either the microblogging platform Tumblr or invoking Andrea Dworkin, in particular, and even at that extreme, often not her genuine positions. Si vous voulez cet article en français, il peut être trouvé à Homme de paille. See the Wikipedia article on Strawman. 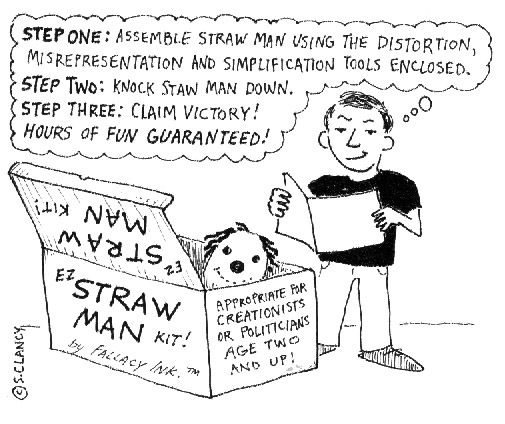 Straw Man Arguments: How to Recognize, How to Counter, and When to Use Them Yourself, Effectiviology. ↑ You Can Lead an Atheist to Evidence, But You Can't Make Him Think: Answers to Questions from Angry Skeptics, p. 30. ↑ Quora: What is an ideological Turing test?